The Navy released a stunning aerial photo of the San Diego-based USS Essex underway in the Gulf of Aden off the horn of Africa. The amphibious assault ship left San Diego unannounced in July along with the amphibious transport dock USS Anchorage and dock landing ship USS Rushmore. The ready group with the embarked Camp Pendleton-based 13th Marine Expeditionary Unit includes 5,000 Marines and sailors. The photo taken Wednesday by Mass Communication Specialist 3rd Class Matthew Freeman is an “image of the day” on the Navy’s website. It shows the Essex underway with helicopters, tiltrotors and jets lining its flight deck. The elevator for lifting aircraft from the hanger deck is visible at the lower right. 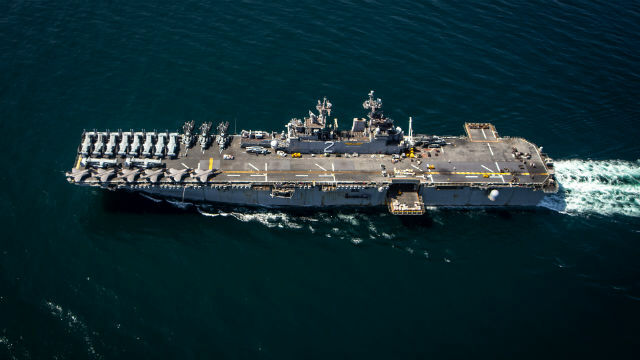 The Essex is the first San Diego-based assault ship to carry the new F-35B vertical-takeoff stealth jet, and six of the new planes are visible at the lower left. The Navy said the Essex is operating in the U.S. 5th Fleet area to ensure maritime stability and security in the Central Region and its strategic choke points.